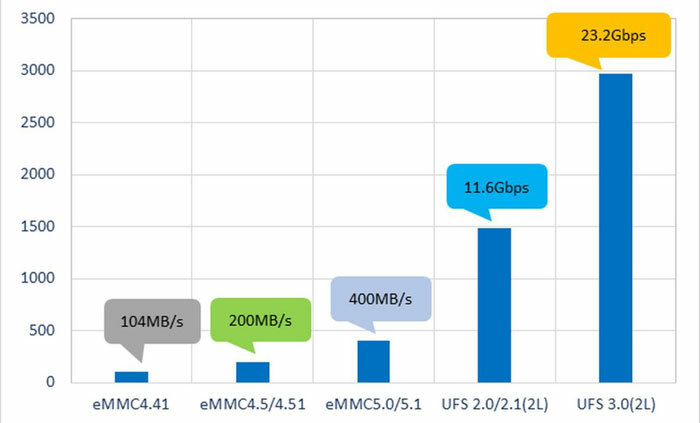 The JEDEC Solid State Technology Association have unveiled the specifications for Universal Flash Storage (UFS) 3.0; this updated UFS doubles performance over the previous generation of Flash Storage, and brings with it key additions specifically designed for the automotive industry. Universal Flash Storage (UFS) is a specification often used for cameras, mobile phones and a plethora of other devices. Generally speaking, UFS uses serial interface and is highly optimized, thus high throughput can be achieved despite operating within a tight power consumption envelope. Naturally, as demands for devices to handle increasingly large amounts of data (such as higher bit rate video), the storage for those devices must similar keep pace, not just in terms of storage space, but also transfer speeds. To this end, JEDEC boasts that UFS 3.0 will provide “a 2x performance increase over prior versions of the specification” over the previous generation of UFS 2.0 or 2.1. This translates into a maximum theoretical speed of 2.9GB/s. The first generation of devices (UFS 1.0 and 1.1) was introduced back in 2011, and used only a single communication lane, allowing for a then impressive 300 MB/s bandwidth. JEDEC doubled both the bandwidth per lane (up now to 600) and also bumped the lanes up to 2 with UFS 2.0 and 2.1 (thus a maximum theoretical bandwidth of 1200 MB/s). With Universal Flash Storage 3.0, this has seen each of the two lanes capable of handling 1450 MB/s, leading to the theoretical maximum of 2900 MB/s (2.9 GB/s) combined. We also see UniPro (Universal Protocol) updated from 1.6 of the previous version to 1.8. UniPro is a high-speed interface technology for interconnecting integrated circuits in mobile and mobile-influenced electronic devices. UniPro 1.8 works combined with the M-PHY V4.1 to form the interconnect layer of Universal Flash Storage 3.0. There were also two key changes made for the usage in the automotive market. The first was extending the temperature range to -40 up to 105c, allowing the memory to be reliable in harsher conditions. The second was adding a refresh operation with added control mechanism, and this was designed to improve device data reliability. Additionally, the UFS Card Extension was updated to version 1.1, although the changes were fairly minor, including support for HS-G1/G2 and G3, along with the addition of power definition for the card, RMS and peak. Below is a comparison table between the different UFS versions. Tagged with automotive, computing, hardware, JEDEC, memory, UFS, universal flash storage.